This is the HTML that the user would navigate to with a web browser. The picture on the left shows what it looks like in a web browser. Typing letters in the top text-box will immediately send an AJAX request to the server, asking for matching names from the database. The list-box below will be populated with those names as soon as the response is retrieved, and with this tiny example and simple database, that happens pretty much immediately, meaning that the listbox will be updated as soon as you type a letter. * HTTP request object (created by this function) as the only parameter. 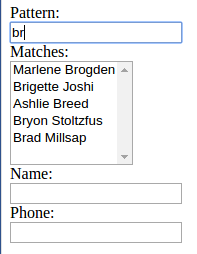 * request for matching names in the phone-book database. * AJAX request for data about the selected person. // response for the request. // if the request failed for any reason (status 200 means success). * Event handler for responses to requests for data about a specific person. The HTML code (at the top) is trivial – I have made no effort to make this pretty or cool. Note the assigned event handlers, though; For the keyUp event on the search box so that the handler is invoked after that the value of the text-box has changed, and for the onChange event for the list-box so that the handler is triggered also when switching selection using the arrow keys.